I ran the SF Marathon! This particular race meant more to me than any other marathon I've run. I wanted it badly last year, and when I dropped to the half due to injury that made it even more enticing this year. 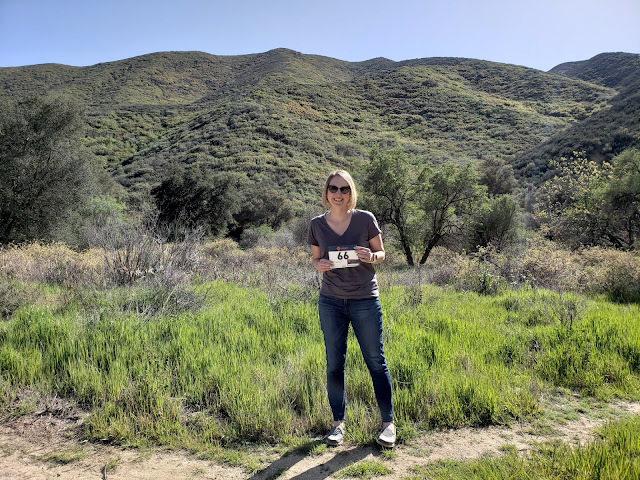 Finally, I ran the main event of the race I love so much and it was everything I thought it would be: beautiful, challenging, and incredibly fun. I've never finished a marathon feeling so mentally AND physically happy. Now, that doesn't mean I felt perfect the whole time, I didn't. I had a rough time in the middle miles of Golden Gate Park. The important thing is that I got through it and was able to recover the body back to a good state. The race starts near the Ferry Building, and we stayed at the Hyatt practically right at the starting line. Kevin headed out earlier than me to start with wave 2, I grabbed hot water for my oatmeal at the hotel breakfast for runners and stayed in the room longer. I left the hotel around 5:30 am for my 5:50 am race start with wave 4, having plenty of time to get to the corral. I didn't use porta-potties or bag check because the hotel was so close. I heard a voice calling my name in the corral and found Marcia, a friend from Go Far, nearby. We started out together and had fun chatting. I'm really happy she was with me for a good part of the race. I ran well for the first few miles and felt super happy, even the little but steep Fort Mason hill didn't phase me. Around mile 5 I took a porta-potty stop and was annoyed, but what can you do. We continued up the hills to the bridge, again feeling great and not needing to walk at all like I did in past years. Cheesin' with Marcia for the photos near the beginning. The bridge felt more crowded this year than in the past, but I was able to dodge people and run the pace I wanted. The time flew by and before I knew it, we were through the vista point aid station and going back across. Marcia and I were separated due to the congestion, but I found her again as we exited the bridge. At this point, we were heading into the part of the first half that I dreaded, the post-bridge hill and the Presidio. I've never felt good through this part and I've always ended up walking in the past. Much to my surprise, the post-bridge hill felt way less steep than in the past and I ran the whole thing! I owe this motivation to Marcia, and she helped me to discover a newfound strength in myself on that hill. We continued over the top of that hill, enjoyed the Lincoln Boulevard downhill, and started climbing again in the Presidio. Similar to the post-bridge nemesis hill, I was able to keep running through the Presidio for the first time ever. Oiselle teammate Michelle was there to give me a high five that kept me going, and I let myself be motivated by Marcia to keep running the whole time. I realized I could do it, and that realization felt amazing. Running the uphill grade into Golden Gate Park was rough as usual; we hit the marathon and half split and then had a slight downhill deeper into the park. I was initially SO excited to be staying with the marathoners, but shortly after my stomach started feeling a little off again. The park loops continued and I made another porta-potty stop around mile 15. Marcia went ahead around that time and I was sad to lose her, but slowing someone else down really stresses me out and for that reason I was glad. I took a few walk breaks but kept moving at a decent pace. I knew if I could push through this spot and get out of the park, I'd be good to go. 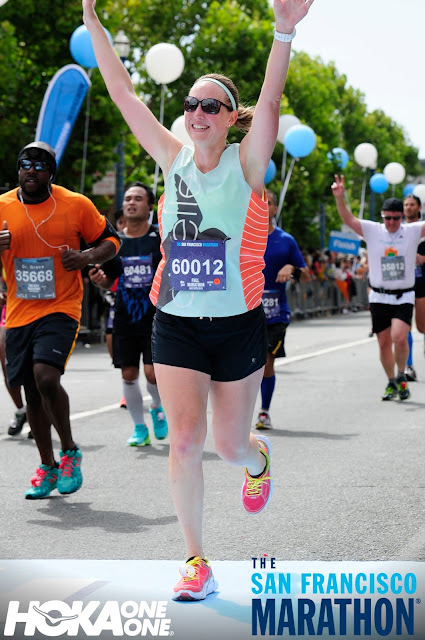 The mental game of park-looping and seeing the half finish line (3 times!) was getting to me more than I could have guessed it would. Finally, we passed the 1st half finish for the last time and continued into the rest of the park. Around mile 18 we exited the park and headed into the Haight, which I'd been looking forward to for a long time. 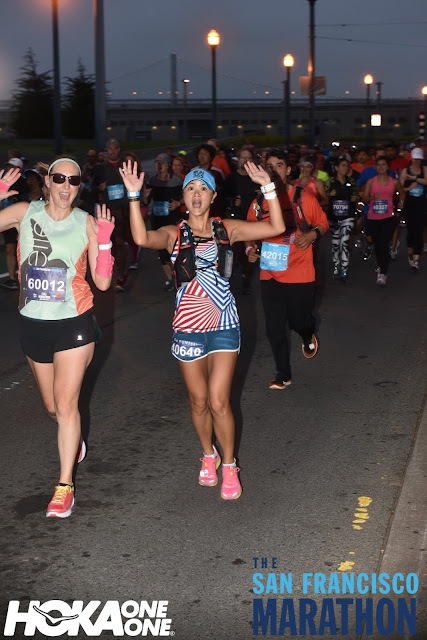 The energy changed for the better and despite the rough miles in the park, I felt better than I ever had at that point in a marathon. This part of the course has some flat and downhill that lets the legs relax a bit. Even with a couple of small hills, the second half is significantly easier than the first half of the course. That said, it's also much less scenic. Somewhere in the 20s, Oiselle teammate Christine, who was running the second half, came up behind me and we chatted for a bit. We ended up around each other for the rest of the race which was really helpful for me. Late in the race, I was still shocked at how well my body was doing. I remember many times where my muscles felt tight, locked up, sore...you name it...by mile 23. Not this time. 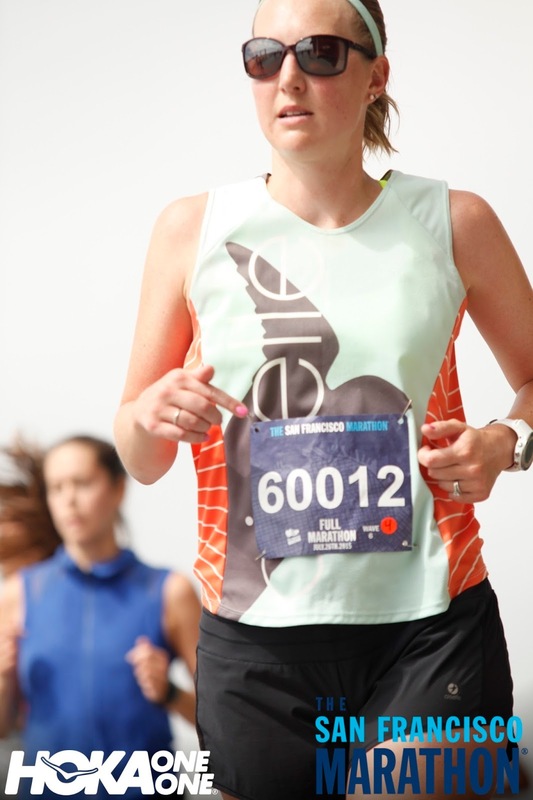 I was getting more and more exited because I was going to finish the SF Marathon and I could still run. We passed the Giants stadium parking lot, where we were cheered on by tailgaters and the November Project group. We continued around the stadium and turned onto the Embarcadero. This was it! I had the biggest smile on my face the whole time we were on the Embarcadero. There were more people, we were along the water, and we were so close to the finish line. I was going to finish the SF Marathon! I finished in 4:38:43 - not a PR, but definitely a strong performance for a hilly course. 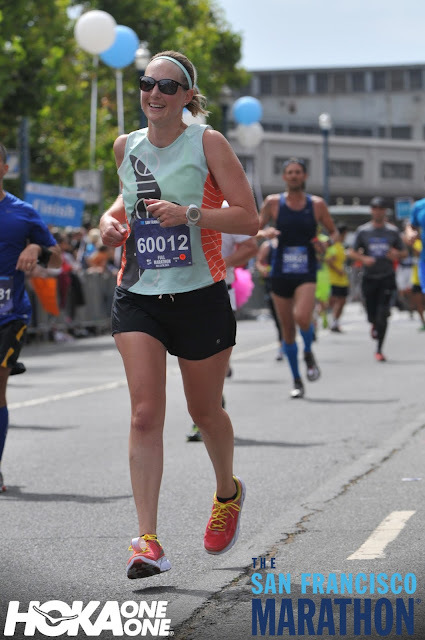 Smiling at the end of a marathon...? I was so freaking happy. There's no other way to describe it. In 2005, I ran my first 5K during the SFM events. In 2009, I ran my first half marathon there. In 2015, I ran the marathon. After going through the finish chute, I found Kevin near the exit to the finish area. He had a good race and finished long enough before me to already be showered. We visited with people in the SFM Ambassador tent for a while after the race and enjoyed a couple of beers. Lagunitas sponsored the beer, including sweat bands. Way too soon, it was 11:30 and we needed to go back to the hotel for me to clean up and check out. What a fantastic day! I'm not going to go into detailed race logistics with this recap, although I feel it was well organized and had no complaints. Check out my past SFM recaps for more on logistics and organization. Congrats on a great race! The SF Marathon is on my bucket list to do one day! Love that city! Thank you! I highly recommend it - you'll have fun! Thank you! :) It took 6 tries, but I got to a happy finish. Haha. So glad to read (and see via photos) that you finished so strong and happy! It must've been especially sweet to come back and run the full marathon after last year's injury. Congrats! Glad you persevered for the marathon this year! I totally relate to that experience having gone thru a marathon but ended up with a very bad flu so I wasn't unable to participate. Lucky for me, this year I was able to join the night race and it felt absolutely good! Finishing the race must've felt such a huge accomplishment - congrats to you! Happy that you were able to finish strong!